Sparkular cold spark effectss are the biggest development in fireworks for decades. They are set to revolutionise the way displays are staged and watched. They are fireworks without the fire. 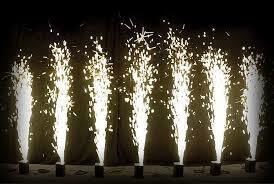 They produce sparks with such a low temperature that you can put your hands in them and feel nothing! This makes them ideal for events like Christmas Lights switch-ons in town and city centres where audiences can watch in completely safety from only a few feet away. They come in two forms: 5 metre high fountains that spray up columns of silver sparks which can be programmed to dance in time to music; and as revolving wheels producing swirls of sparkling silver. Have a look at this video sample to see cold sparks in action.